Put away the binder of boring invitations and let Pretty Lil' Notes design something just for you! Custom doesn't have to be costly, and we strive to create gorgeous, high quality invitations to suit every bride and every budget. Cottony thick bristol papers and elegant, square flap envelopes add that extra special touch and make a striking first impression. Vibrant colors and a smooth, matte printing finish enhance our striking designs and set the tone for your special day. 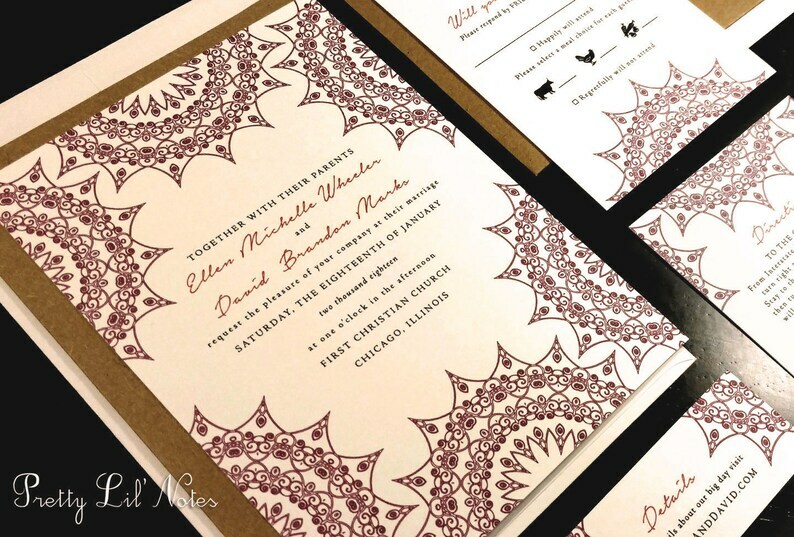 Our work doesn't stop there, we are also happy to create other items to complete your wedding stationery (including programs, menus, thank you notes, place cards... just to name a few). Order a custom sample made just for you! This listing is for a CUSTOM SAMPLE SET of the invitation shown above with your names, color, font and paper choice. We are happy to take the time to customize our samples, so you can truly get a feel for the finished product. Sample orders typically ship within 48 hours. We are happy to provide a formal quote upon request, see below for additional details. Cost is listed per piece based on total quantity ordered (with a minimum order of 35, please) so you only purchase what you need! Add as many or as little cards as you like to customize your set. If you are working with a tight budget, contact us and we are happy to offer money saving suggestions. We customize ALL copy on each piece to suit your needs. Perhaps you would prefer to list your website rather than registry information or you have a romantic quote to include on the invitation... Just let us know! Kraft, Color, Metallic, Textured and Pockets also available! Please contact us for a quote. Surprise your guests when they open their mailbox with a beautifully printed, full color envelope to complement your set. Let us handle the stress of addressing, so all you have to do is stuff and stamp! If one of our designs has caught your eye but you would like to handle the printing, we can provide a high resolution electronic file ready to print for any of our designs (typically ranges from $35-$50). If you have something truly unique in mind, but just haven't found it yet, we can work together to create a one-of-a-kind design just for you...we would LOVE to hear your ideas! Please contact us for more details. Send us your order specifications and we will send you a final quote and secure invoice for payment. Once we receive your deposit ($50) we can begin customizing your design and making your wedding stationery truly unique. We offer unlimited electronic proofs until we get it right. We strive to keep the design process easy and fun, so you can sit back and let us handle all the details! Please allow 10 days for us to design, proof and print your order. If you have a tight deadline to meet we'll do our best to accommodate your needs at no additional charge. Thank you for visiting Pretty Lil' Notes, we hope to hear from you! Amazing to work with! Kendra was so easy to work with and very helpful throughout the process. She answered all my questions and made a beautiful card for our company. Will be using her again! CUSTOM ORDER Design and Photo Retouching Collage Christmas Holiday Card Family Kids Couple Pets Business - Digital and Prints Available! Custom Design and Photo Retouching Collage Christmas Holiday Card Family Kids Couple Pets Business - Digital and Prints Available!